It has taken me so long to plant my little garden here. There was far too much information coursing through my mind—ecotones and hedges, guilds, layered food forests, medicinal companion plants, swales and ponds and microclimates. I would gaze out at the muddy clay of this unfamiliar soil and feel too overwhelmed to start. Or, more truthfully, too fearful of making a mistake. Of not building a garden complex enough, beautiful enough, after all of these years of landscape design and permaculture training. Garden after garden that I’ve designed, labored over, loved, and left behind. After a while it hurts. So I built no garden here. But somewhere I read this, or heard this—I forget now where— “the perfect is the enemy of the good.” And I realized that I was doing what I have done far too often in my life, letting my desire for perfection inhibit me from acting at all. And so I covered a circle of grass with cardboard, shoveled compost and decomposed leaves over it, built a low wattle wall around it to hold them in. Every day I’d toss my eggshells in, or kale stalks, or the trimmings from my sons’ haircuts. As winter lengthened snow compressed the leaves, rain soaked the cardboard, and worms tunneled up through the rotting grass of the lawn beneath it, digesting and aerating and fertilizing. Last week when I dug my hand down beneath the leaves, I came up with a fistful of gorgeously fat worms and loose brown earth. No cardboard, no clay. I adore sheet mulch! And because I knew that if I sat down to design a medicinal garden or food forest I’d get lost in my ideas and never actually plant anything, I simply laid a path of bark and began to plant. 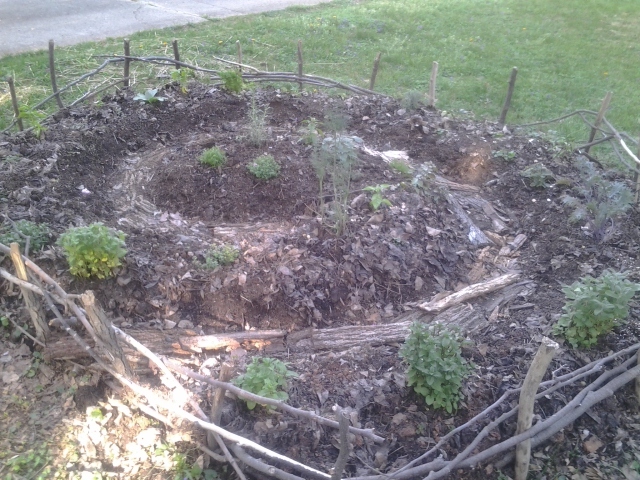 My tiny spiral garden now provides me with chamomile and bee balm, greek oregano and pineapple sage and several varieties of mint. It has curly kale and dill and thyme and strawberries and stevia and lavender. 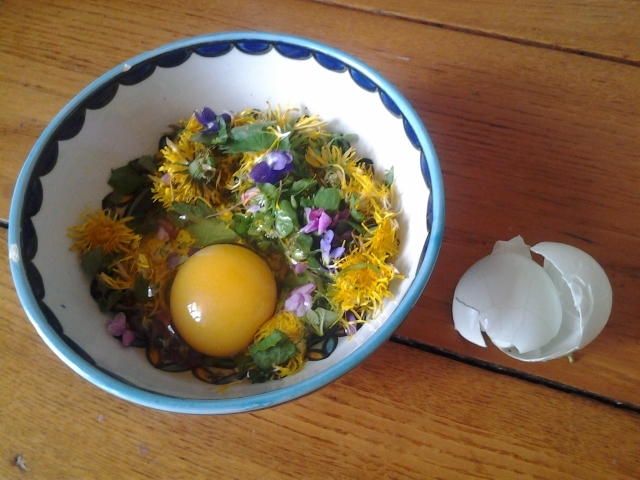 I walk through the dewy grass each morning with my colander and scissors to harvest herbs for my morning eggs or tea. It brings me such joy. Such a simple thing, wet grass between my toes and the first songs of the birds and the scent of basil. To me these are the building blocks of a beautiful life. This afternoon my four-year-old and I gathered fistfuls of dandelion as we biked home from his preschool. He crouched in the grass and carefully plucked white and purple violets, and I lifted him high to harvest redbud flowers from the tree. 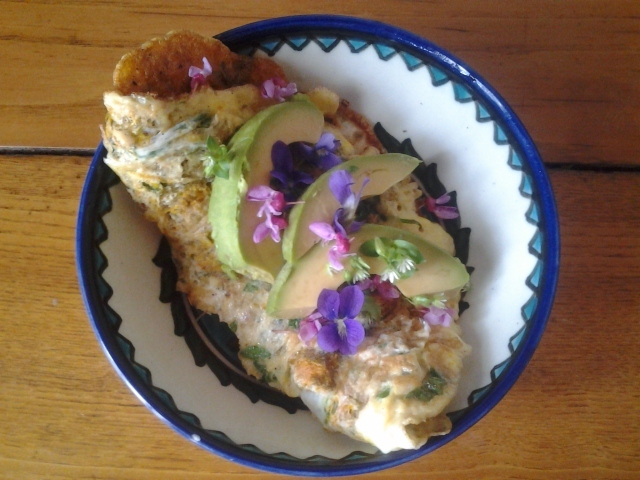 We whisked the dandelions and violets into eggs with some oniongrass and chickweed and filled our flower omelettes with kefir cheese we’d strained the night before. 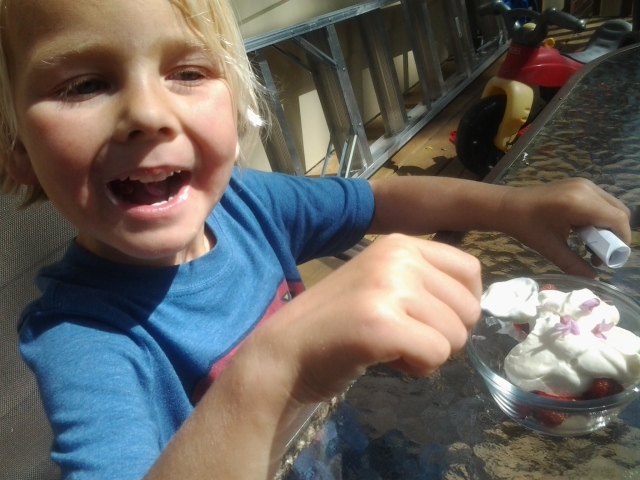 He helped me whip cream and we sliced strawberries from our tiny circle garden into it, sprinkling redbud flowers on top. 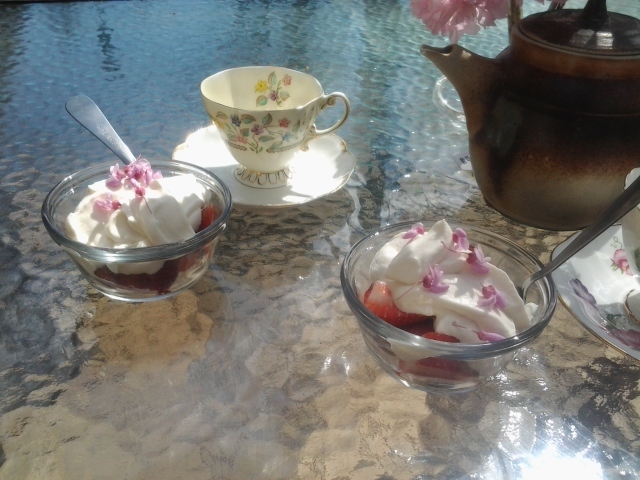 And then we feasted, to celebrate the spring. If I had waited until I’d designed the perfect garden, or until I owned my dream farm, or until I had cooked the compost perfectly, I would have deprived myself of this perfect golden afternoon. I would have missed the sight of my sweet son on hands and knees, thoughtfully munching a violet directly from the ground and then collapsing in laughter. I am not going to allow the perfect to keep me from the good. I am going to love exactly what I have, fiercely, and with forgiveness. I hear you. I amused my permaculture course participants by turning up with all my graphed sheets of my backyard where i had put my dreams down on paper. This had taken me 6 mths of planning and wishing. “Just plant something” they said. It took another month but i eventually put it together. In my blog i posted about the three stages (with much amusement) of the planning, creating and then growing. My suburban veggie patch give me so much pleasure that i cant wait for the weekends to work on it. Shhhh….. i also creep out at 6.30 in the morning to check on this and say good morning to everything on weekdays. You certainly have a thorough knowledge of what to do, now just do it. 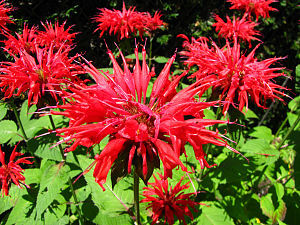 The thing i have had to learn to get over is that the garden is forever changing and evolving and that if i make a mistake i just change it next season. These are hard things for an Accountant to get over that requires everything to be balance the first time. Enjoy the process. Regards from Oz. wow, Lynda, I’ll have to check that out! thanks for the encouragement. swales and a small guilded food forest are next! it’s funny how i can confidently design gardens for clients and friends but balk at my own. there’s a wonderful jungian book called “addiction to perfection” that i think I’d better reread quick!! thanks so much for your comment. and i LOVE your idea of nabbing the children for appointments with life. i am definitely going to pinch that…so it’s a perfect exchange! thanks Fran!